Both born in Atlanta, Ga in Historic West End District growing up around each other in the same neighborhood until graduating from J.E. Brown High School. I chose to serve my country after graduation for 10 years with dual serves (Navy/Army)honorably. I also participated in 2 campaign’s (Panama Special Operations attachment, and Desert Storm) during my enlistment. 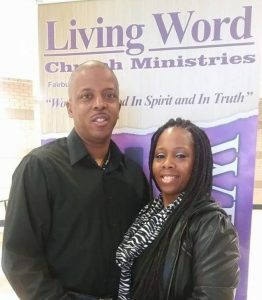 I married my childhood sweetheart and joined Living Word Church Ministries. Since becoming a family member of this awesome entity of faith, I coordinate men fellowship trips at least once a year specifically to create that atmosphere to become better men to serve GOD, and even better husbands/fathers to our wives and children’s. My Name is Min.Cindy R. Williams. I am Native of Atlanta, Ga. I have been married to my Amazing Husband Charles Williams for 4 years. I have 5 children 2 Grandchildren. Together Charles and I have 8 children 5 grandchildren whom we love so dearly. I’ve worked in the Mail Industry for 17 years I was Team Leader for 5 years with Pitney Bowes now employed at Metro Air Service Material Handler. In 2002 I start my own Business TOUCH OF GLORY CLEANING SERVICE where God gets the Glory in all that I Clean. My husband Charles and I are owners and CEO’s of Blissful100Adventures Travel Agency. Where we enjoy helping families experience financial freedom by owning their own business. I joined Living Word Church Ministries in 2013 under the anointed amazing leadership of Pastors William & Bridgette O’Neal. The love drew me. The Word of God keeping me. I later became a member of the Hospitality Committee that I love serving. I became a Licensed Minister of the Gospel on February 20th, 2018 where God gets all the glory any time I’m up to minister. I have a passion for God’s people because we are one body different gifts. on your own understanding in all your ways submit to Him and He will make your paths straight.